We offer a free tyre inspection service at our garage. Just call in if you need your tyres checked. 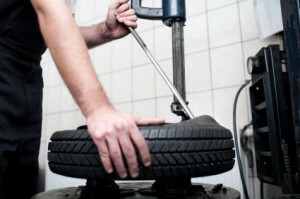 We supply a puncture repair service for cars and light commercial vehicles. Most punctures can be repaired while you wait. We will balance and refit your tyre to get you back on the road. Nearly all tyres are tubeless these days buy some tyres still use an inner tube. We stock tubes to fit all sizes if required. If your tyre has been damaged for example driven whilst flat or been cut by a sharp object we would advise fitting a new tyre. Damaged tyres are unsafe and could let you down unexpectedly.